Present: Russel (honcho), Madrona (fish wrangler), John (boat), Laurie (truck), Winnie (net), Julia (website). 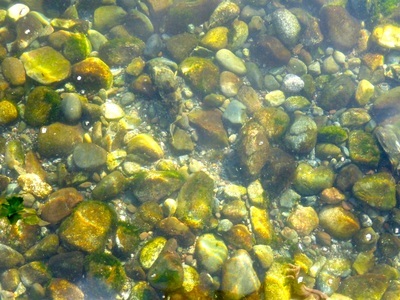 It was a truly lovely afternoon, with a pleasant breeze, cheerful sunlight, and clear water. The first pull was at 4:45. Much to our surprise, with Laurie on the truck, it only took three or four of us to be able to pull in the net. This will be the last seine of the 2014 season. 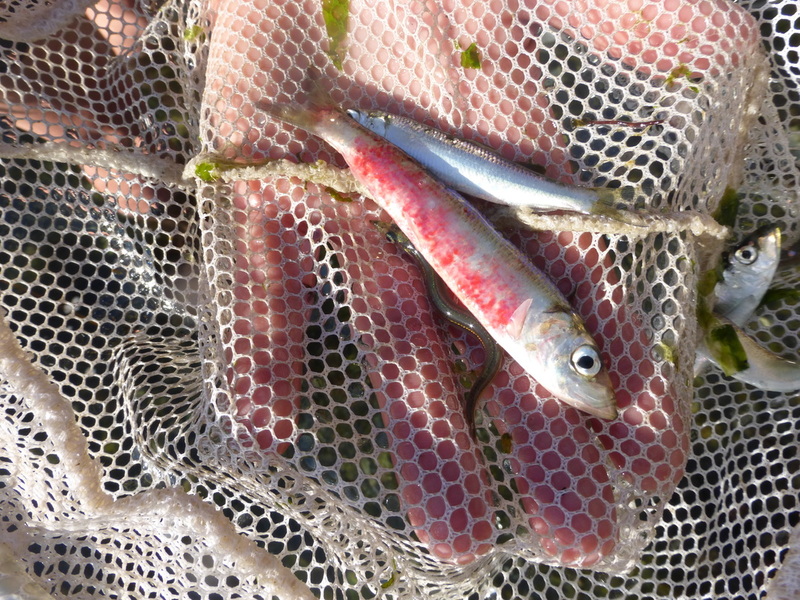 We caught a lot of herring in the first pull, but, sadly, almost 5% of them were afflicted with VHSV, or Viral Hemorrhagic Septicemia Virus (31 out of 650). This is a fish disease that is exacerbated by poor diet, temperature, and confinement in fish pens, according to various research papers I skimmed. 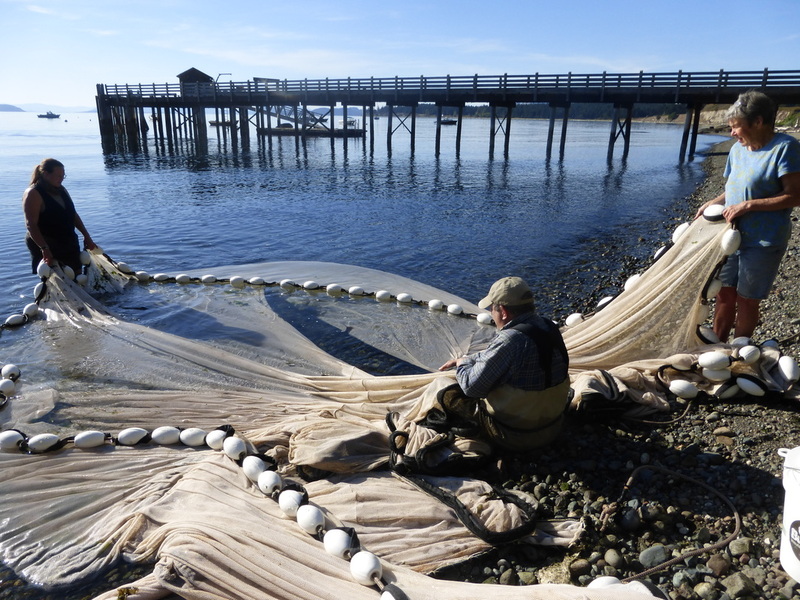 We saw it in the herring, but according to that well-known fish disease authority, wikipedia, it also afflicts salmonids and has been found in the Pacific Ocean since 1988. 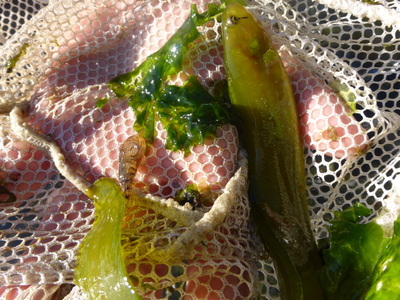 The image below shows a sick herring, some apparently healthy ones, and a pipefish. We collected 20 of the sick ones for analysis by NOAA. Interestingly, somebody said, "Eeeeew, this is like fish ebola!" and the NOAA VHSV site observes the same thing. It was very disturbing to see. 1 Bay Pipefish. It was male, as evidenced by its pouch. Click on the images below to see remarks. 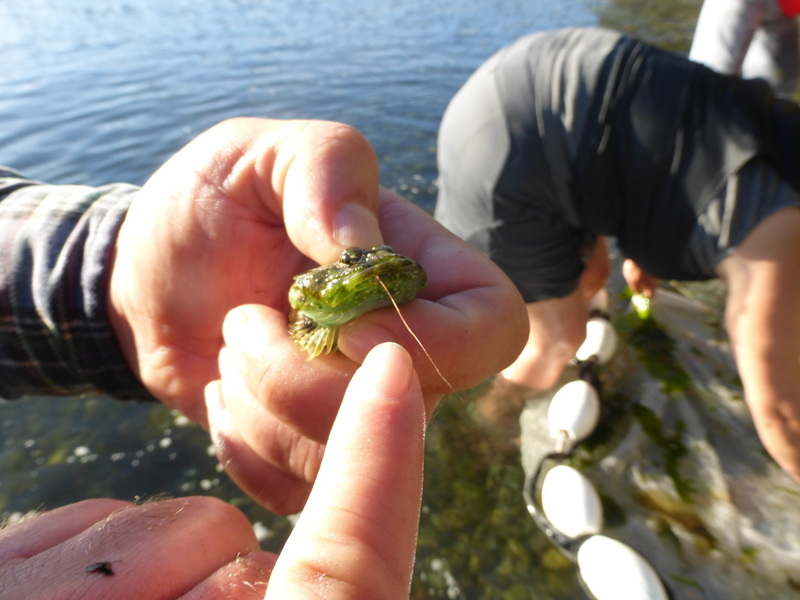 The one Chinook that we caught was a recapture. We always clip their lower tail fin for DNA sampling. It grows back over time, and it's a good way to tell if a recapture is "ours." Below are some photos of how we process chinook. The first image shows the setup. Russel is on the left. He handles the record keeping, and makes sure that all the samples go into correctly labeled tubes. Julia is on the right. I measure the fish from nose to tail fork, and use the water syringe to sluice out the fish stomachs. Not shown is the "gut packing" team, which takes the lavage samples and puts them into labeled tubes, using clean paintbrushes or tweezers. 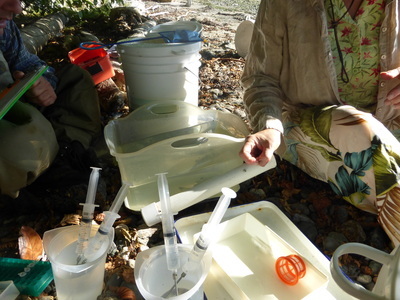 Russel and Julia collaborate in taking the fin samples. 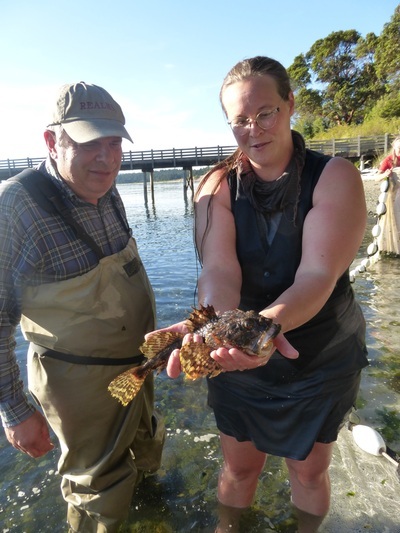 Julia holds the fish ready, steadying the tail, and Russel clips a small amount off and puts it into a tube that gets sent for stream-of-origin analysis. 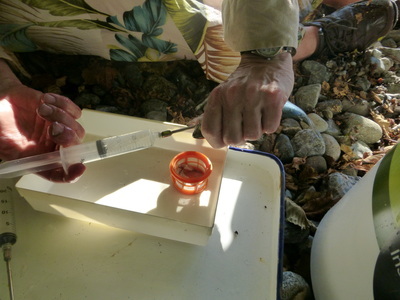 After Julia is finished processing the fish, three or four fish scales end up stuck to her hand, which Russel removes with an index card, labels it, and sends it off so that the age of the fish can be determined. At the top center is the bucket in which the fish await their doom. It has an aerator on it, and in the hottest part of summer, an ice pack inside to keep the water at a healthy temperature for the fish. In the center is the anesthesia tub. 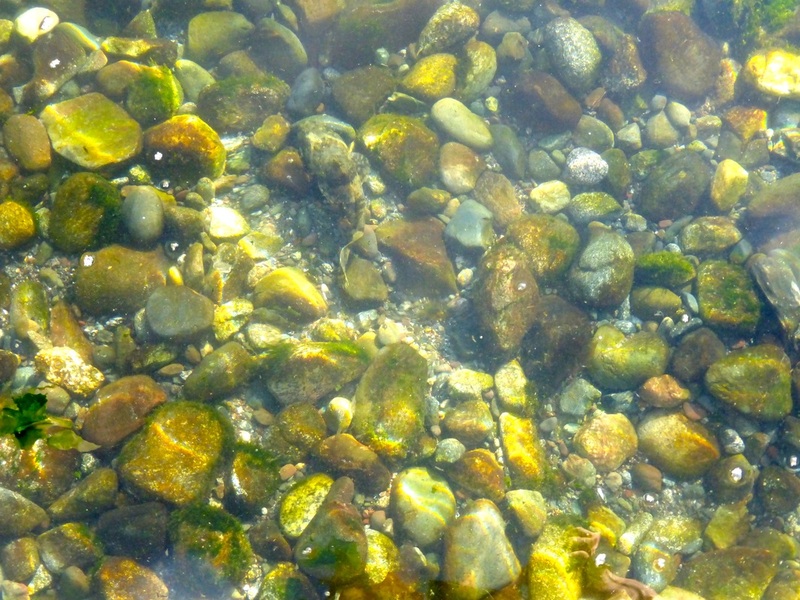 You can see the salmon in the bottom right corner, feeling woozy. Julia has just picked up the ruler, an ingenious device made from a PVC pipe with a ruler glued into it. It holds the fish steady when it's being measured. In the lower center of the image is a tub of filtered water with the water syringes in it, and next to that the clean tub with an orange strainer in it. In a perfect world, the contents of the fish stomach go into that strainer, but often it gooshes out into the tub as well. In the second image, you see the salmon being measured (178 mm) in the ingenious device. Note that the clipped tail is healing. In the third image, Julia has slipped the syringe into the mouth and down into the stomach for a second bout of lavaging. 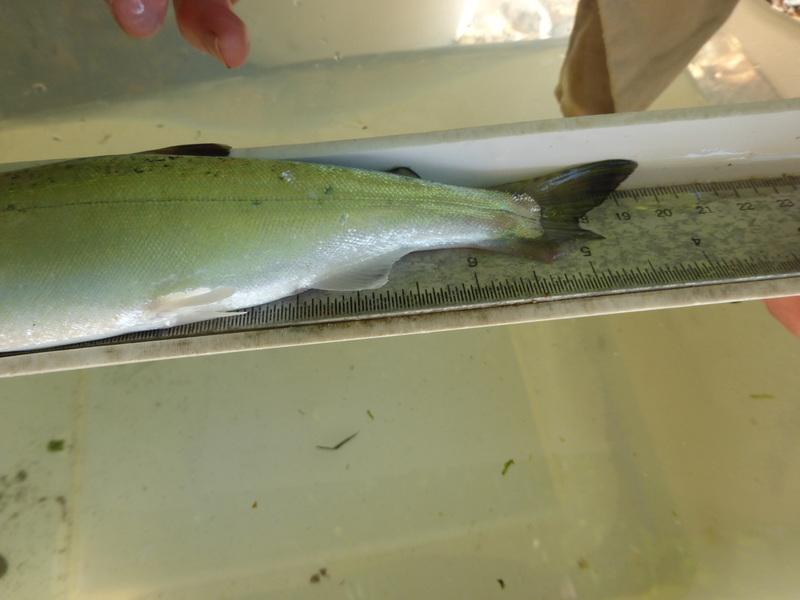 You can see that this salmon had eaten a herring, which had a parasitic worm inside it. After its experience, it recovered from anesthesia almost at once and swam happily off into the shallows, leaving behind a stomach sample (packed in ethanol and ready to be counted by our plankton counting team later in the year), a tail fin sample (to be sent off for stream-of-origin DNA analysis), a scale sample (to be sent to NOAA for age analysis), and a body length measurement (to be crunched into the general data stream). We were hoping to find more Chinook but they were elsewhere. 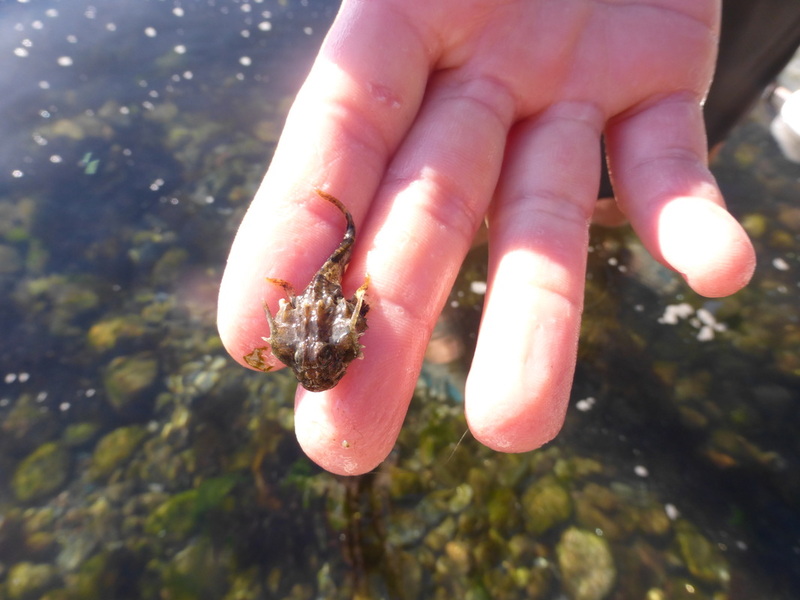 We did catch a head-sized rock, though, which should count for something. 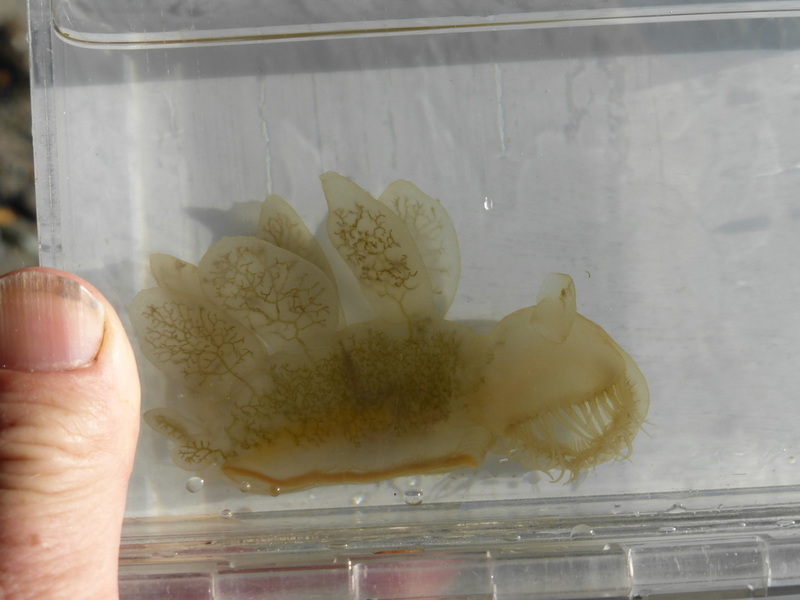 1 Melibe nudibranch. It smelled like lemon cleaner! 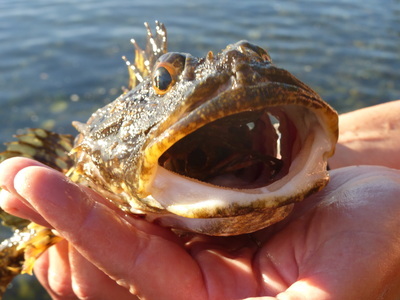 Below you can see an image of a great Great Sculpin. The next sculpin has crab in its mouth, and the one after that has a shrimp antenna sticking out of its mouth. 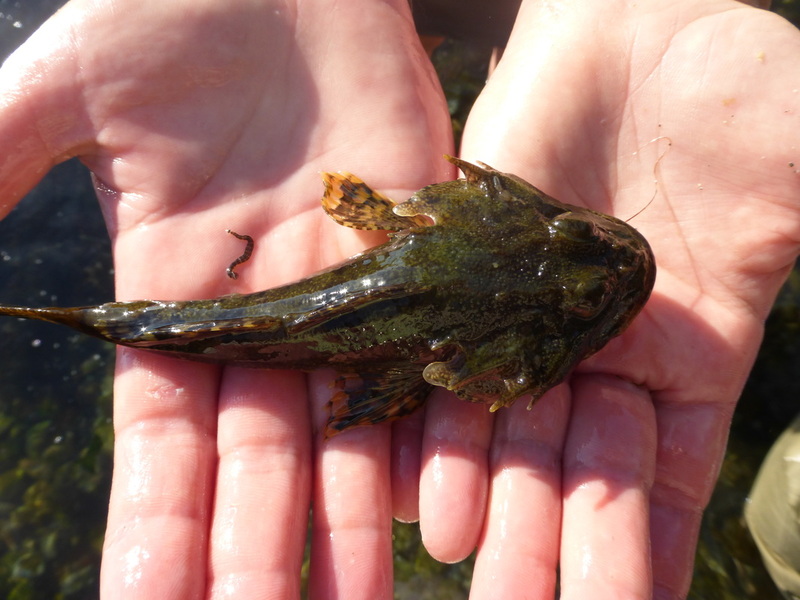 Can you find the sculpin in the first image? Hint: It looks like a rock. The second image is of the Melibe. Please note that a group of them is called a "bouquet" because of the smell. Also note its scary mouth.